Jesse is a 6 year old boy who has been diagnosed with Cerebral palsy. Jesse has poor head and trunk control due to low tone and decreased core strength. He has a feeding tube and is prone to seizure activity. Jesse communicates using an augmentative communication device (ACD), which generates speech for him. Jesse requires assistance with personal care tasks. Jesse uses an electric wheelchair with supervision of his assistant to participate in school activities. Due to Jesse’s poor trunk control he requires lateral supports and a headrest on his wheelchair to enable him to maintain an upright sitting posture and to reduce fatigue. Jesse attends the same primary school as his older sibling and receives Occupational therapy, Physiotherapy and Speech and language therapy. Jesse’s goals within therapy included: Improving head and trunk control, increasing strength and coordination of the upper body and to participate and access school activities with his peers. Jesse’s Occupational Therapist provided him with the opportunity to use Playpak within therapy sessions and within the classroom environment to increase his independence and allow him to participate in the same activities as his peers. 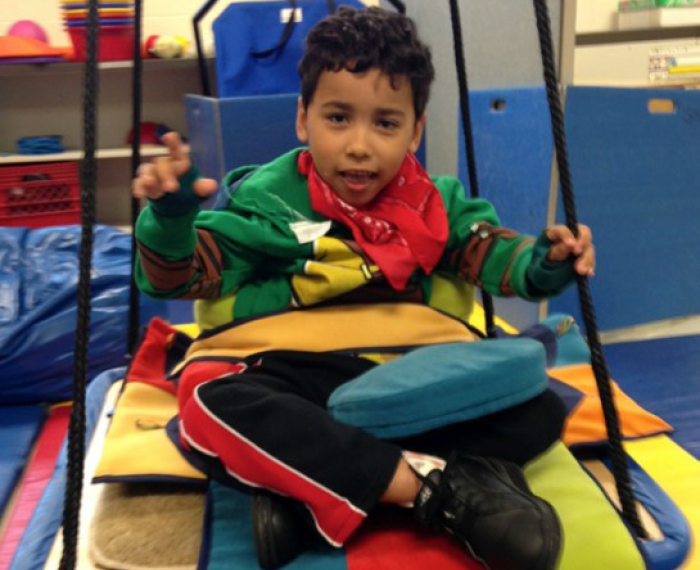 Playpak was used on the platform swing during therapy to help develop his sitting tolerance and balance. Motor tasks were used to improve his hand eye coordination – for example: catching a ball with two hands. Playpak was used within the classroom setting to enable him to sit on the floor and participate in reading time and improve his bilateral hand coordination through gross motor tasks – for example: picking an object from the left side of his body and placing it on the right side. Playpak provided Jesse with the opportunity to sit alongside and interact with his peers during educational activities, whilst the other children liked exploring his fun and colourful piece of equipment. 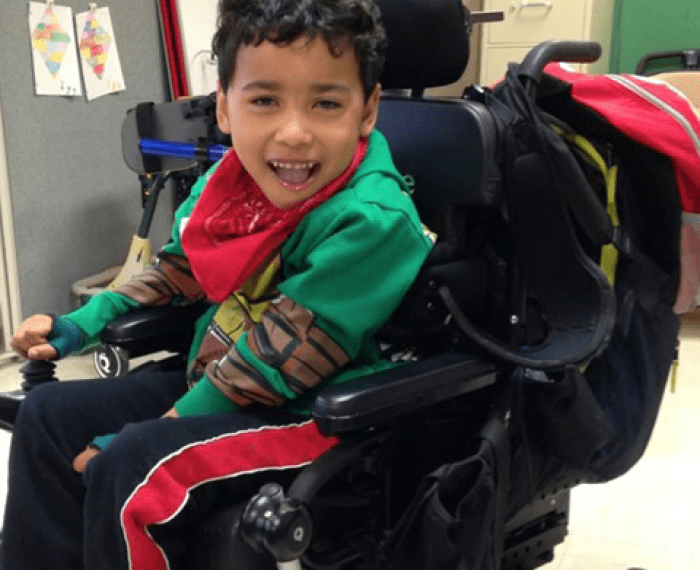 Jesse’s powered wheelchair raises him to a higher level compared to the other children and therefore made interacting in floor time activities more difficult. As a result of using Playpak on the platform swing Jesse’s trunk stability and gravitational insecurity (fear of being off the ground) has improved. It has helped to develop his spatial awareness and given him the confidence to hold on to the swing with his non – preferred hand, which he previously found more difficult. 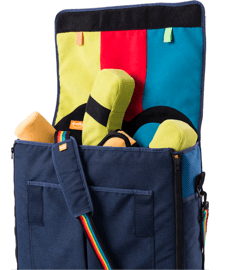 Jesse’s therapist commented, “Jesse has increased access to items on the floor and items placed to the front and side of him in the Playpak versus in his other supported seating options”.